Mattycollector.com has posted new images of Teela, one of two October releases for the Masters Of The Universe Classics line. Click on the headline to view all of the images! I'd be surprised if this sells out same day. This is, so far, the only figure from this line I've had no interest in. I'd want to get her just for Zoar. How can you not want the females in this line? 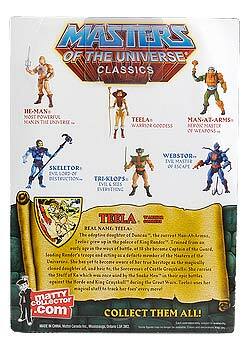 lol This is one of my "must-haves" from MotUC. I can't wait for Evil Lyn too. I don't have to worry about this figure, since subscription will bring her to me. I can't wait. Along with the one from my subscription, I will def order 1 more, maybe 2. Those along with 2 Super Zodaks coming out the same day, I'm saving up now. Either those first two comments were sarcasm (LOL) or those posters may be the types that only like the boys. Not that there's anything wrong with that. Not sarcasm, I just really liked the original Zoar. I don't own any of the MOTUC figures (just can't afford it right now). I like Teela, but I prefer Evil Lyn and the Sorceress. Maybe Evil Lyn will come with Screeech, too. Just a reminder that Teela and Zodac go on sale this Thursday at 12pm eastern.